President Mahmoud Abbas' decisions on peace talks will play a key role in Israel deciding whether to release a new batch of prisoners, the chief Israeli negotiator said Tuesday. Justice Minister Tzipi Livni, speaking at a conference, linked the scheduled March 29 release of 26 veteran prisoners to Palestinian willingness to push forward with peace talks. "In order to advance serious negotiations, we will all need to take decisions and prove we are determined to reach an agreement and real peace. That burden of proof is also on the Palestinians' shoulders," she was quoted on her Facebook page as saying. "Accordingly, we will examine the issue of the prisoners, meaning that the key to the cells of the Palestinian prisoners is also to be found in the hands of Abu Mazen (Abbas) and the decisions he will take in the coming days." Livni's remarks came after Israeli officials suggested the release might not go ahead unless the Palestinians agree to extend talks beyond a looming April 29 deadline. Livni denied she was trying to finger point, but said she was raising the issue "before decisions are taken" as the two sides mull whether to move into a second phase of US-led negotiations. So far, 78 of 104 veteran Palestinian prisoners have been freed in three tranches, with the final group due to be released on March 29, pending approval by the Israeli cabinet. But senior officials, quoted by the Makor Rishon daily's diplomatic correspondent on Twitter, said that "without an explicit commitment by Abu Mazen to extend the talks, there will not be a fourth wave" of releases. Peace talks relaunched last July have made next to no progress, marred by bitter disputes over core issues, and Washington is fighting an uphill battle to get agreement on a framework proposal that would extend the process to the year's end. Earlier, a senior cabinet minister also cast doubt on the planned prisoner release, and said if it did go ahead, it would not include any Arab Israelis jailed for nationalist attacks. 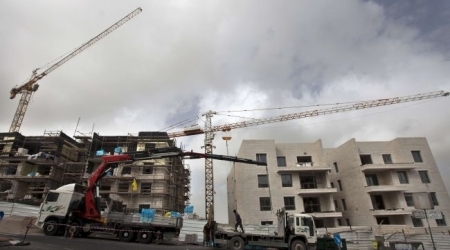 "The (original) decision said (the release) should be dependent on progress in the negotiations and now it is clear to everyone that there has been no progress," Economy Minister Naftali Bennett told army radio. Bennett, an outspoken hardliner who opposes a Palestinian state, also said Israel had never promised to free Palestinian citizens of Israel. The Palestinians have reportedly named 14 Palestinian-Israelis they want freed, but all names must be approved by Israel. 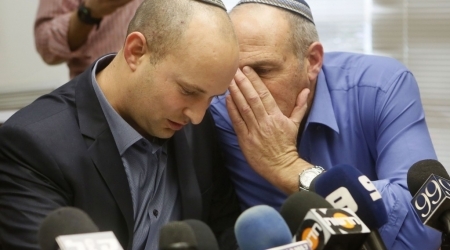 "The government of Israel never took any decision to release Israeli prisoners," Bennett said, describing such an idea as "delusional." Bennett also accused Abbas of staying in the talks purely to ensure another 26 prisoners were freed. His remarks were made a day after Abbas told US President Barack Obama that releasing the prisoners would be a good step to demonstrate Israel's seriousness about the peace process. Suggestions that Israel may not follow through with the release have further exacerbated tensions, with Washington working hard behind the scenes to head off a crisis that could deal a death blow to the fragile dialogue between the sides. The pledge to free 26 Palestinian prisoners this month will definitely not include Arab Israelis and may not even take place at all, an Israeli minister told army radio. Economy minister Naftali Bennett, an outspoken hardliner who opposes a Palestinian state, said Israel's pledge to release them was unlikely to happen because there had been no move in the US-led peace process. And if it did, the government would never agree to release Arab Israeli citizens jailed for nationalist attacks, he said. The Palestinians have reportedly named 14 Arab Israelis they want freed, but all names must be approved by the Israeli government. Qadura Fares, head of the Ramallah-based Prisoner's Club, said the upcoming release was crucial. "The Palestinians are adamant on this point. 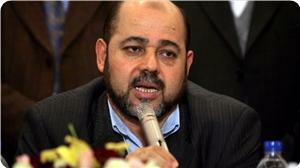 The prisoners must be released on time," he told Voice of Palestine radio. As part of a goodwill gesture to the Palestinian negotiators, the Israeli occupation has released so far 78 out of 104 veteran Palestinian prisoners in two separate batches in August and October 2013, with the final group due to be released on March 29. The so-called peace talks between the PA and the Israeli occupation resumed in July 2013 after a 3-year-long stalemate conditioned that a final-status resolution to the Israeli-Arab conflict be reached within nine months. Hamas's political bureau member Mousa Abu Marzouk said that the meeting that took place on Monday between de facto president Mahmoud Abbas and US president Barack Obama would not engender positive results. "Why will the other side give you something while you are in a difficult situation internally and the Arab surrounding around you is much worse, not to mention that there are international and regional priorities other than the Palestinian cause?" Abu Marzouk said addressing Abbas on his facebook page. "There are also an American sponsor that cannot disengage from the entanglements of AIPAC and the Zionist vision of the conflict," he added. The Hamas official expressed his belief that Abbas was summoned and not invited to meet with Obama, who aims to push ahead with Kerry's peace mission and spare it any failure, regardless of its achievement of the Palestinian aspirations or not. In a related context, political science professor Abdul-Sattar Qasem expressed fear that the Zionists and the Americans could achieve their plan to liquidate the Palestinian cause through wagering on the negotiations with the Palestinian Authority and imposing their vision of the final solution. Qasem ruled out, in a press remarks to Quds Press, that the meeting between Abbas and Obama in Washington could realize any Palestinian demands. "President Mahmoud Abbas…is a weak man having no charisma of a leader. It is known that he entered the realm of politics through the American support. It was Washington which created the position of prime ministry for him and brought him to power, so it is unlikely that he could stand before the president of the largest and greatest country in the world to speak bravely about the Palestinian rights," he added. "What we will see today is no more than an enslavement scene, in which president Obama will speak and president Mahmoud Abbas will listen," Qasem emphasized. Thirty percent of West Bank settlers living farthest from Israel’s boundaries are willing to leave their homes if fairly compensated, even without a peace agreement, a study showed. The report released today by Israel’s Blue White Future peace group focuses on 100,000 Israelis living outside larger settlement blocs. It excludes some 250,000 residents in the bigger settlements. The numbers rise to 50 percent if a peace agreement is reached; 40 percent would refuse to leave. U.S. Secretary of State John Kerry is trying to persuade Palestinians and Israelis to agree on a framework for continuing peace negotiations beyond the nine months they originally approved, ending April 29. President Barack Obama meets with Palestinian President Mahmoud Abbas today at the White House to push for the agreement after a March 3 visit by Israeli Prime Minister Benjamin Netanyahu. A voluntary evacuation “would unequivocally demonstrate that Israel is serious about seeking a two-state solution” and “increase the chance of the negotiation track succeeding,” said Gilead Sher, a former Israeli peace negotiator who is the group’s co-chairman. The government hasn’t indicated that it is working on such a plan. 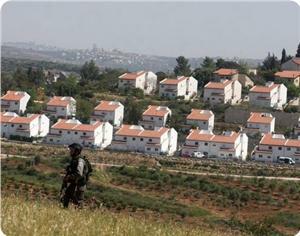 The survey of 501 settlers conducted in August had a margin of error of 4.5 percentage points. On Tuesday 18 March 2014, at 7:00 PM, AICafe invites you for a Panel discussion on the One State Solution with Mohannad Abu Gosh, Mikado Warschawski and the Haifa group for One Democratic State. Numerous commentators note that ending the Israeli-Palestinian conflict via a two state solution is doomed to failure as this increasingly unrealistic solution does not fully address all of the issues involved in the conflict. Come discuss with leading activists and thinkers about a one state solution and what this could mean for Palestinians and Israelis. Each speaker will give a 10-15 minute presentation, after which an open discussion will be conducted with the audience. Mohannad Abu Gosh, an activist with the Haifa group for One Democratic State, will compare the two and one state solutions and review the issues related to one state, including democracy for all and the Palestinian right of return. Mikado Warschawski, an Israeli activist and commentator, will speak about what a one state solution could mean for Israeli society, with reference to the demographic issue and an end to the Zionist colonial project. 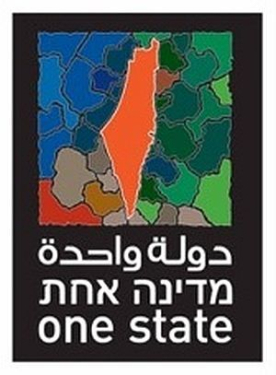 Delegates from the Haifa group for One Democratic State will discuss the possible realities of equality in one state, looking at examples such as South Africa where the end of apartheid did not end systematic discrimination within society. Come be part of the discussion about a One State Solution! Standing opposed to recent comments by the Israeli Defense Minister Moshe Ya'alon, President Shimon Peres describes Mahmoud Abbas as a serious peace partner, several Israeli newspapers report. During a meeting with Congolese human rights activist Rose Mapendo, the President stated that; "President Abbas is a man of principle, he is against terror, against violence." He further added: "We are at a crucial stage of the negotiations and we must do everything we can to ensure they carry on," and continued; "There is clear majority and agreement on a solution of two states for two people." This is in stark opposition to Israeli Defense Minister Moshe Ya'lons assessment of the situation. He stated Saturday that, "Abbas is a partner who takes, not a partner who gives. He is not a partner for a permanent peace agreement that includes recognition of Israel as the national state of the Jewish people." 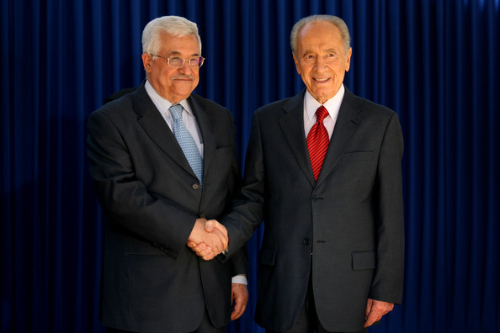 Peres on the other hand sees the need to, "... continue working with the Palestinian Authority and [Mahmoud Abbas]. He is a good partner and I am glad our government is negotiating with him." 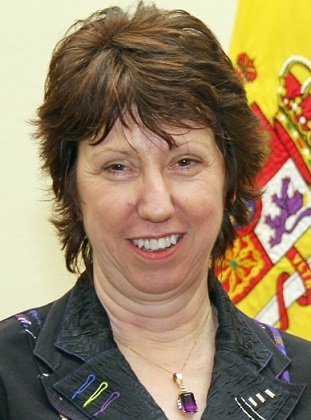 He further added: "Disagreements are a normal thing and that is why there are negotiations – to solve disputes. There are also issues that we do agree on such as the war on terror." Abbas is in Washington D.C. at the moment, to discuss the preliminary framework, that will be used as a basis for the peace negotiations. Thousands of Palestinians took to the streets of West Bank cities Monday in support of President Mahmoud Abbas' visit to Washington for talks with Barack Obama about the peace process with Israel. 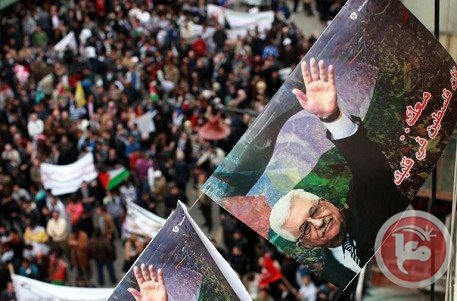 Demonstrators waved the Palestinian national flag as well as that of Abbas's Fatah party, chanting "we are with you, president!" as Abbas was to weigh up an anticipated US request to extend the faltering negotiations with Israel. "We're here today to stand up to pressures upon us and make sure president Abbas adheres to his convictions," said Nasser Eddin al-Shaer -- former Palestinian education minister and member of Fatah's Islamist rivals Hamas -- who joined a 5,000-strong rally in the northern West Bank city of Nablus. Some 1,500 people turned out in the West Bank administrative center of Ramallah, and more than 1,000 in the southern flashpoint city of Hebron. Abbas was to meet President Obama in Washington on Monday, having traveled to the US nearly a fortnight after Israel's Prime Minister Benjamin Netanyahu did the same, and as an April 29 deadline for the nine-month negotiations loomed. Palestinian and Israeli leaders have been unable to move the talks forward since US Secretary of State John Kerry kick-started them at the end of July after intense efforts to bring the sides back to the table following a three-year freeze. 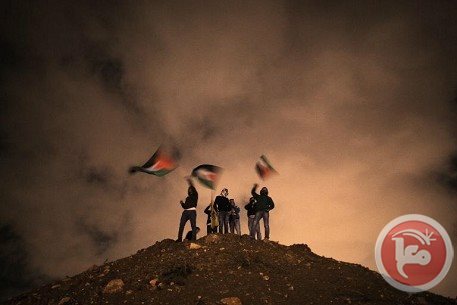 Bitter recriminations have taken precedent, with the two sides refusing to budge on key issues such as the borders of a future Palestinian state, security arrangements in the West Bank, the fate of Palestinian refugees and the final status of Jerusalem, claimed by both sides as a capital. Israeli President Shimon Peres sought to clear the air on Monday, issuing a statement of support for Abbas. "President Abbas is a man of principle; he is against terror, against violence. He is a good partner and I'm glad that our government is negotiating with him," Peres's office quoted him as saying in a statement. "We are all waiting for peace; it is the wish of the Israeli and Palestinian people." The US is to propose a framework on which to base final status talks and has been calling for an extension of negotiations pending agreement by both sides on that framework. Israel has recently kicked up a new obstacle to ending the decades-long conflict, demanding Palestinian recognition of it as a Jewish state. Palestinian leaders have categorically rejected the calls. In the Hamas-run Gaza Strip, public demonstrations were banned, but Fatah supporters nonetheless gathered at the Al-Aqsa University, a bastion of the West Bank-based movement. "We informed Fatah members of the ban on celebrations they'd demanded to support Abu Mazen (Abbas), in order to maintain public order, and fearing that inter-Fatah differences could air themselves in public," said Islam Shahwan, a spokesman for the Hamas government. Abbas has had a spat with an exiled Fatah leader Mohammed Dahlan, both accusing each other of complicity in the death of late Palestinian president Yasser Arafat. Witnesses said there were confrontations between Fatah members at the 2,000-strong rally at Al-Aqsa University. US President Barack Obama on Monday told President Mahmoud Abbas that both he and Israeli leaders must make tough political decisions and take "risks" for peace. Meeting Obama at the White House, Abbas said a scheduled Israeli release of a fourth tranche of Palestinian prisoners by March 29 would show how serious Prime Minister Benjamin Netanyahu was about extending peace talks. "As I said to Prime Minister Netanyahu when he was here just a few weeks ago, I believe that now is the time ... to embrace this opportunity," Obama said as he met Abbas in the Oval Office. "It is very hard, very challenging. We are going to have to take some tough political decisions and risks if we able to move forward," Obama said. The US leader was seeking to secure Abbas' agreement on a US framework to extend peace talks, which have so far lasted seven months but not made tangible progress, past an end-of April deadline. He said that everyone already understood the shape of an "elusive" peace agreement between Israel and the Palestinians, saying it would be based on 1967 lines with mutual land swaps. Abbas did not directly address the Israeli government's demand for the Palestinians to recognize Israel as a "Jewish" state. He noted, through a translator, that the Palestinians had recognized Israel's legitimacy in 1988 and in "1993 we recognized the state of Israel." Abbas also noted the agreement that the Palestinians have with Israel on the release of a fourth batch of prisoners by March 29. "This will give a very solid impression about the seriousness of the Israelis on the peace process." Israeli ministers said last week that they would have difficulty approving the release if agreement was not reached to extend the peace talks. Israel committed to the release of 104 Palestinian prisoners in four tranches when talks were launched in July. It has so far released 78 of those in three batches, with Palestinians demanding the fourth -- scheduled for later this month -- also include Palestinian citizens of Israel. Current and former Palestinian officials reacted to the meeting with pessimism, saying America's long-standing support for Israel made a peace deal unlikely. "As long as the US is incapable of exercising pressure on Israel there will be no peace in the Middle East. A framework agreement or proposal cannot be a substitute for real solutions to the Palestinian-Israeli issue," Mustafa Barghouti, a Palestinian lawmaker, said in a statement. "The way to a solution is simple. End Israel's nearly 47-year-old military occupation and settlement enterprise and allow Palestinians to be free. That is impossible as long as Israel is allowed to remain above international law and act with impunity." Diana Buttu, a former PLO negotiator, agreed. She said Obama had ignored Israeli actions on the ground meant to undermine the peace process. "Since the start of these talks in July 2013, Israel has killed more than 40 Palestinians, announced the construction of nearly 12,000 illegal settlement units on occupied Palestinian land, and destroyed hundreds of Palestinian homes," Buttu said. "Rather than condemning these actions, President Obama has remained silent, sending the message that Palestinian life is cheap and that Israeli violations of international law and American policy will never be challenged." She added: "Instead of encouraging the sides to prolong these pointless negotiations, Obama should be cutting off assistance to Israel until it begins to act in accordance with US policy, and lifting the complete immunity with which it has shielded Israel from international sanctions." Abbas stressed the continuation of efforts for a solution based on the international legitimacy and the 1967 borders so that the Palestinian people will gain their independent state, with east Jerusalem as its capital, and a just agreed upon solution for refugees issue. He thanked Obama for his country's political and economic support for the state of Palestine to stand on its feet and for giving this historical opportunity to continue with the U.S. administration's exerted efforts in order to achieve peace and end this Israeli-Arab conflict. 'We count on your efforts, which you exert despite of your many international concerns, in order to achieve peace as soon as possible,' said Abbas. 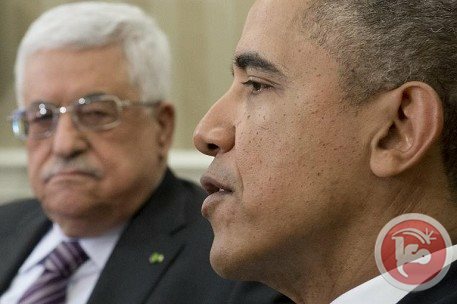 Meanwhile, Obama commended Abbas as saying, ' He [Abbas] has been somebody who has consistently renounced violence, has consistently sought a diplomatic and peaceful solution that allows for two states, side by side, in peace and security; a state that allows for the dignity and sovereignty of the Palestinian people and a state that allows for Israelis to feel secure and at peace with their neighbors. 'I believe that now is the time for not just the leaders of both sides but also the peoples of both sides to embrace this opportunity for peace. But we’re going to have a lot of details that we’re going to have to discuss,' added Obama. 'It’s very hard; it’s very challenging. We’re going to have to take some tough political decisions and risks if we’re able to move it forward,' he added. Obama pointed out that the Palestinian Authority has continued to try to build strong institutions in preparation for a day in which the Palestinians have their own state, and that he will continue to emphasize the importance of rule of law, transparency, and effective reform so that not only do the Palestinians ultimately have a state on paper, but, more importantly, they have one that actually delivers on behalf of their people. 'The United States obviously has been a strong supporter of the Palestinian Authority---We’re the largest humanitarian donor and continue to help to try to foster economic development and opportunity and prosperity for people,' said Obama. 'I look forward to a productive discussion, and continue to hope that you and Prime Minister Netanyahu, but, more importantly, the people of the Palestinian Territories and Israel are ready to move forward in a new spirit of cooperation and compromise,' Obama concluded. The League of Arab States, in a statement Monday, affirmed its support of President Mahmoud Abbas in the ongoing US-sponsored Palestinian-Israeli negotiations. Deputy Secretary-General of the League of Arab States, Ahmad Bin Helli, stressed the importance of Abbas’ visit to the U.S. today to discuss the latest developments on the peace process with the U.S. counterpart, Barack Obama. “The Palestinian issue is experiencing a crisis due to Israel’s ‘intransigence’. Therefore, the United States, which has undertaken sponsorship to negotiations, should take the Palestinian issue out of the current impasse caused by the Israeli Prime Minister, Benjamin Netanyahu,” said bin Halli. He added the U.S. maybe capable of rescuing the negotiations by obliging Israel to achieve a just and comprehensive peace as per stated in the Arab Peace Initiative, calling upon the U.S. to pressure Israel to abide by the international terms of reference regarding the peace process. “We still affirm that if the Palestinian issue remains unresolved the region will remain troubled, and all [the concerned parties] should hold the responsibility in this regard,' he said. President Barack Obama will meet President Mahmoud Abbas on Monday, seeking to keep a US peace drive alive two weeks after also piling pressure on Israel to agree to extend talks. Obama will meet Abbas after telling Israeli Prime Minister Benjamin Netanyahu that tough decisions are looming ahead of an end of April deadline to agree on a framework for future negotiations. But so far, Washington seems keener to prolong the initiative than Israel or the Palestinians, as a blame game rages that appears more a preparation for a breakdown of talks than cultivating the political ground for future concessions. Obama told Netanyahu when they met at the White House on March 3 that the peace framework cannot be simply a deal agreed by Israel and the United States and then presented to the Palestinians as a take-it-or-leave-it offer. But officials also privately say that the Palestinians will be required to make concessions on issues like the return of refugees and borders if they are to secure a state at long last. White House spokesman Jay Carney said Obama's message to Abbas will be consistent with the one he gave to the Israelis. "He will commend president Abbas, as he did Prime Minister Netanyahu, on the tough decisions that each leader has made thus far in an effort to move the process forward," Carney said. "He will speak of the need to establish a framework for negotiations going forward and the need -- as that takes place, for additional tough decisions to be taken. "We hope that we will see progress." Abbas said last week that he could not yet assess the "framework" because he had not seen it -- during the seven-month long peace drive that has reportedly yielded no agreements on key issues. "When the framework is presented to us, we'll give our opinion on it," Abbas said on Thursday. "We have never discussed prolonging the negotiations at all, nor was it offered to us." Abbas met Secretary of State John Kerry on Sunday ahead of the talks with Obama, who spent the weekend being briefed by his top officials on a more pressing foreign policy crisis, the showdown with Russia over Crimea. A senior State Department official said the Kerry-Abbas meeting was "frank and productive." "We are at a pivotal time in the negotiations and while these issues have decades of history behind them, neither party should let tough political decisions at this stage stand in the way of a lasting peace," the official added. The most nettlesome issues in the peace process include the borders of a future Palestinian state, the fate of Jerusalem and Palestinian refugees, Israeli settlements, security and mutual recognition. The Palestinians want borders based on the lines that preceded the Six-Day War in 1967, when Israel captured and occupied the West Bank, including now-annexed East Jerusalem. They have also insisted there should be no Israeli troops in their future state. But Israel wants to retain existing illegal settlements it has built inside occupied Palestinian territory over the past decades. It also wants to maintain a military presence in the Jordan Valley, where the West Bank borders Jordan. Ahead of Monday's talks, several senior Israeli figures heavily criticized the Palestinians, and Kerry, as a row raged over whether Israel should be recognized as a "Jewish" state in return for Palestinian statehood. Current Palestinian leaders have opposed such recognition, fearing it could threaten the rights of non-Jewish Arabs living in Israel, who make up 20 percent of the population, as well as other religious minorities. Israeli Environment Minister Gilad Erdan said that Kerry was "wrong because he is putting pressure on the wrong side." "Kerry should be asking Abu Mazen (Abbas) why he is stubbornly refusing to recognize Israel as the Jewish state," he told public radio. Israeli Defense Minister Moshe Yaalon said over the weekend that Abbas was "not a partner for a final peace deal." The United States has been making the case to both Israel and the Palestinians that if a deal is not agreed soon, the opportunity for a Palestinian state and a permanent peace could fade forever. "If not now, when? And if not you, Mr Prime Minister, then who?" Obama said, paraphrasing his appeal to Netanyahu in an interview with Bloomberg View columnist Jeffrey Goldberg earlier this month. Dozens of Palestinian non-governmental organizations called on de facto president Mahmoud Abbas to reject any peace agreement detracting from the Palestinian people's national rights and their aspiration for return to their homes. 80 NGOs on Sunday signed a petition, released by the Palestinian NGOs network, demanding Abbas, who is supposed to meet US president Barack Obama in Washington today, not to bow to the US pressures. The petition stressed the need for upholding the national rights, which the Palestinian people and everyone believing in the justice of the Palestinian cause have struggled for. Abbas arrived in Washington on Sunday and met with US secretary of state John Kerry in his home, in preparation for his meeting on Monday with Obama. The meeting is believed to be aimed at pressuring the Palestinian side to accept the US-drafted framework peace agreement. In a related context, Jamil Mezher, a senior official of the popular front for the liberation of Palestine (PFLP), said the coming meeting between Abbas and Obama would bring another "net profit" for the Israeli occupation and the US administration. Mezher called in press remarks on Sunday for necessarily withdrawing from the peace talks with the Israeli occupation, stressing that the negotiations are pointless and aimed to pressure Abbas into accepting solutions killing the Palestinian cause. He slammed Abbas for turning his back to the vast majority of his people who refuse his negotiations with the occupation, and ignoring the obvious American bias in favor of the Israeli side.